Barel Karsan - Value Investing: Is It Really Defensive? Companies will often take credit when revenue growth outperforms economic growth, using sentences beginning with "Despite the current situation, we...". But these same companies will be quick to blame the economy in the face of lower than expected results (e.g. "The economic crisis caused..."). Therefore, the investor needs to be able to determine whether management is indeed outperforming. Despite the general economic malaise currently gripping the global economy, it is still possible to find companies experiencing record sales and profits. But some companies may be beneficiaries of circumstance. These companies could be in industries with positive long-term trends (e.g. health, education), they could be in industries that aren't much affected by recessions (e.g. producers of consumer staples), or they could be operating in niche segments that for whatever reason are experiencing temporary bouts of strong demand or little in the way of competition. To avoid overpaying for such a company, it's important for investors to be able to identify that external factors (which may be temporary) are benefitting a company. oil supplies), while in others it can be a matter of weeks. Consider Kewaunee Scientific (KEQU), maker of laboratory furniture. A combination of favourable factors for demand along with low competition has resulted in strong revenues for this company. But it's important to keep these numbers in perspective. Assuming the current revenue and profit levels will continue for the foreseeable future may result in an investor's overvaluation of its stock. In other words, it is easy to get sucked into believing that these numbers can only improve, considering that we are in a recession. "Our programs and strategies over the past few years to make Kewaunee a stronger and more competitive company were put to the test. 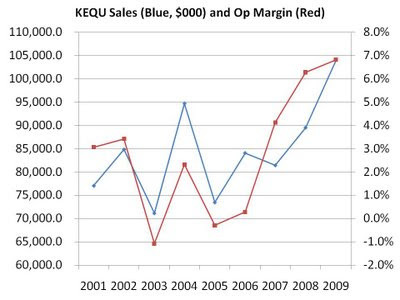 Despite [economic] and other challenges, year-over-year increases in sales and net earnings were achieved for each quarter of the year..."
"We accomplished much in realizing cost reductions and improving our products, but were not able to overcome the unfavorable marketplace and declining sales...Uncertainties surrounding the November presidential election, significant increases in construction costs, and fewer state funds available for projects, all combined to reduce the number of laboratory projects..."
To determine whether current revenues and margins are sustainable, investors must consider the underlying business. Does the company have a competitive advantage which should allow it to hold onto its record profits, or is demand cyclical and/or will competition reduce profitability to more normal levels? Rather than accept the biased explanation of managements, investors must use their own judgement, and not only rely on current earnings (which may be abnormally high) in valuing a company.